With the growing concerns in the scientific and health communities over increasing levels of antibiotic resistance, antimicrobial peptide bacteriocins have emerged as promising alternatives to conventional small molecule antibiotics. A substantial attention has recently focused on the utilization of bacteriocins in food preservation and health safety. Despite the fact that a large number of bacteriocins have been reported, only a few have been fully characterized and structurally elucidated. 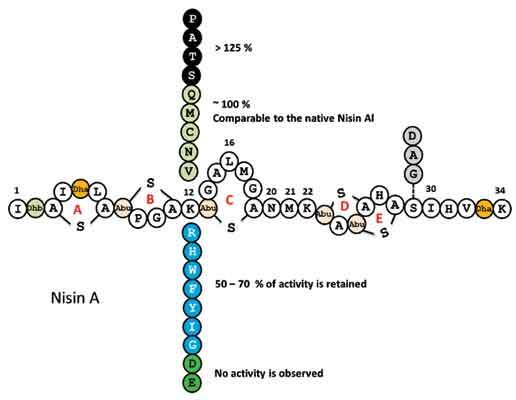 Since knowledge of the molecular structure is a key for understanding the mechanism of action and therapeutic effects of peptide, we centered our focus in this review on the structure-activity relationships of bacteriocins with a particular focus in seven bacteriocins, namely, nisin, microcin J25, microcin B17, microcin C, leucocin A, sakacin P, and pediocin PA-1. Significant structural changes responsible for the altered activity of the recent bacteriocin analogues are discussed here. Bacteriocin analogues, Bacteriocins, Structure-activity relationship. Chapman University School of Pharmacy (CUSP), Chapman University, Irvine, CA, 92618-1908, USA.